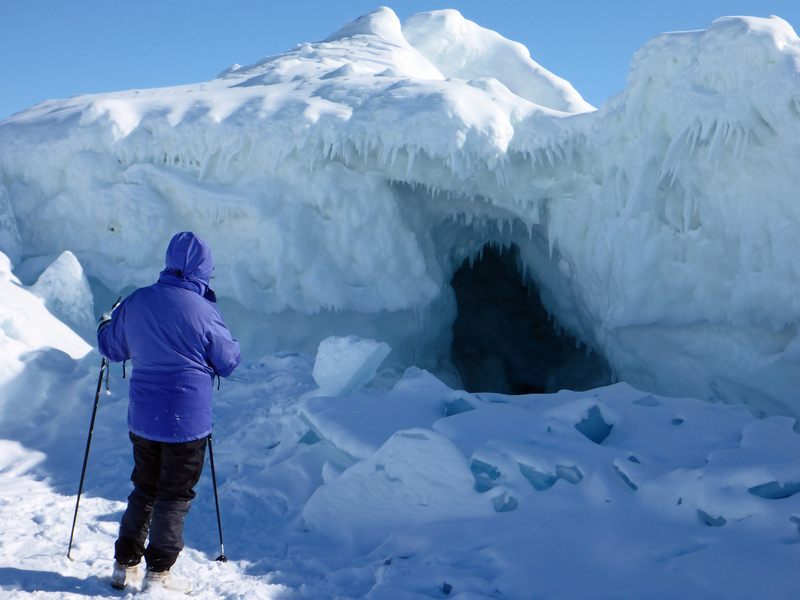 Ice caves formed in the shelf ice all along the tip of the Leelanau Peninsula. Photo: Howard Meyerson. 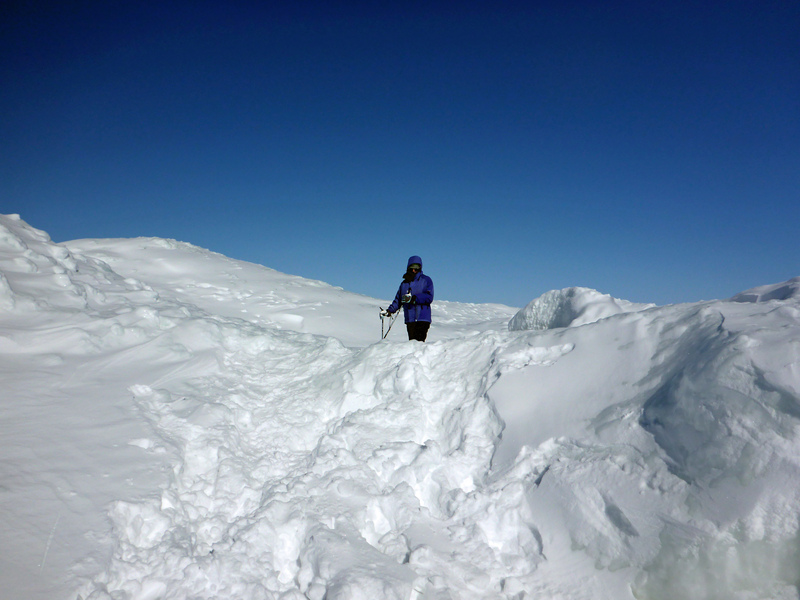 NORTHPORT, MI — As I moved cautiously from one ice knob to another, planting ski poles for added support in the uneven and slippery terrain, the northwest wind seemed intent on pressing southward, blunting the warm glow of the sun. After so many bleak and gray winter days, having clear skies and sunshine was a delicious treat. People from all-walks of life had converged on this area, the frozen Lake Michigan landscape at the tip of the Leelanau Peninsula. They were gathered in small groups of two and three, spread out on the ice, maybe with children in tow. 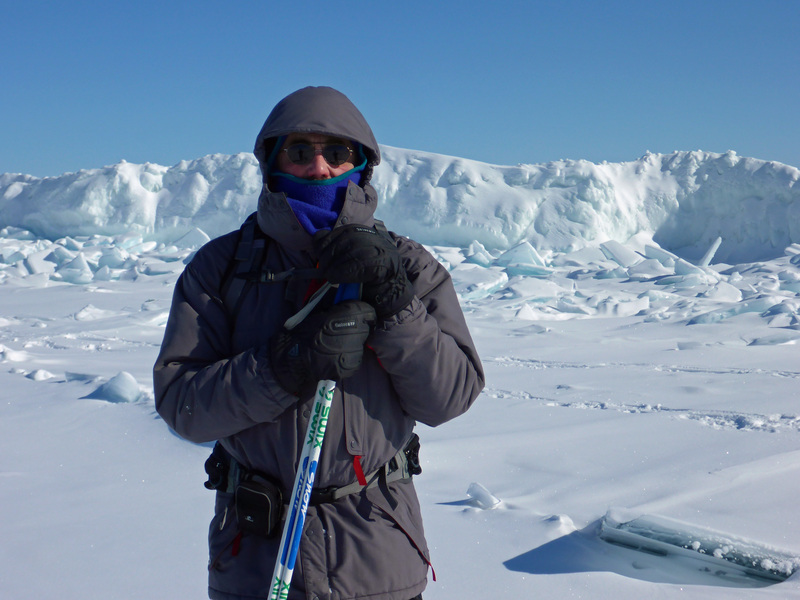 Each of the explorers seemed tiny against the vast frozen expanse. We had come north to cross-country ski and had for one day, a marvelous day with deep fresh snow on the trails, but the frozen shoreline had proved irresistible. 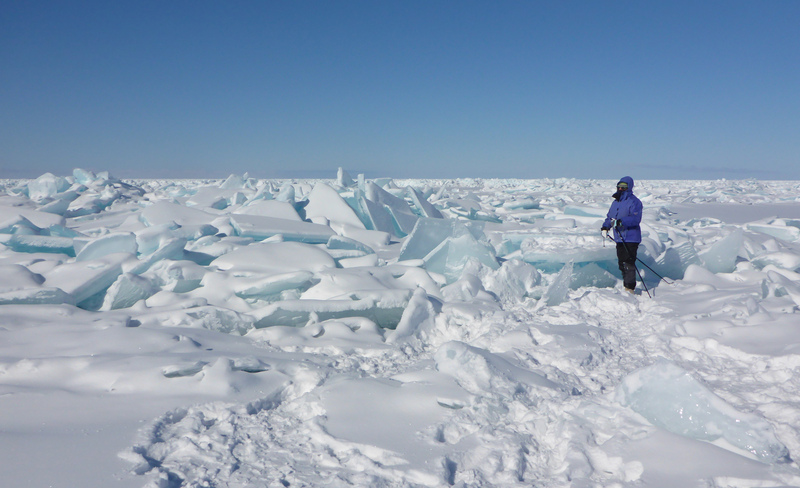 To walk out on Lake Michigan at the height of this year’s deep-freeze was like walking on the moon, so barren and desolate – and like walking in the Arctic at the height of winter. The wind chills were below zero. The day called for all the extras: a balaclava, a beanie and a hood. It was an outing tolerated only with extra-heavy gloves, multiple layers and heavy boots that even then required constant movement lest toes begin to freeze. sheets of ice that lay stacked and broken into so many pieces of blue crystal covered in snow, I found myself mesmerized by the hauntingly beautiful terrain. Just how do indigenous arctic cultures manage to live and thrive, I wondered – a rhetorical question mostly, but not totally, though bordering on illumination. The answer, of course, is one born of eons of behavioral and genetic adaptation. I pulled my hood down tighter, pulled the edge of my balaclava up a bit, and curled my fingers into my palms to warm though my hands were encased in heavy gloves. City life during a harsh winter is not unlike the view you get when wearing a long-billed ball cap – a view with short horizons. You watch the sidewalk closely lest you slip. You watch for potholes lest you bust a strut. You drive watching for snow drifts, black ice and unwary pedestrians, all the while carefully monitoring other cars in the middle of a white-out. Being out on the ice under a radiant sun was like a breath of fresh air – an endless landscape of awesome beauty and wonder. inviting us to come and look. And so we did. We ambled over, stepping carefully, picking at the surface with our ski poles. Then we lay down on the flat ice and pushed our noses up against it and looked down through the clear window where her children had swept the snow away. Below was the pastel-colored rocky, bottom of Lake Michigan, perhaps five feet down, as clear as can be – where all was still, as though frozen in time. There was something magic about the moment; a deep sense of quiet prevailed inside me. I knew I was hogging the hole, but didn’t want to give up the view. I did eventually pull away so someone else could look and mumbled something about not seeing any fish. Then we all exchanged warm pleasantries and the two of us walked off to see some more of the frozen lakeshore. The ice caves along the shoreline were surprising in their complexity, full of frozen stalagmites and odd-shaped ice formations, sometimes lit by rays of sunshine that bored into the their frigid interiors from an open surface connection. They were intriguing to see, but no more so than the broken ice sheets –some six and eight and ten inches thick – the rubble of pressure ridges that piled up along the shoreline created by the vast sheets of moving ice that broke apart as they collided. No less compelling, though certainly different, was the wide-open expanse of ice that extended as far as we could see – tempting us to continue further, inviting further exploration – were it not for the unrelenting cold. I peeled my sleeve back to get a glimpse at my watch. It was close to 3 p.m., later than I could explain. We had spent hours on the ice poking around, eons perhaps, but they had passed quickly – and it was time to return to the land of short horizons. This entry was posted in Uncategorized and tagged Adventure Travel, Caves, Hiking, Ice, Ice Caves, Lake Michigan, Leelanau Penninsula. Bookmark the permalink.